A ceramic heater might just one of the best purchases you make this winter. You may be asking yourself, “what do I look for in a ceramic heater?” We’re here to help you figure that out. We’ll go over some things to keep an eye on before we dive into the best ceramic heaters that we could find. Stay warm and comfortable this winter with one of these great investments! Let’s get started. Auto Shut Off: The automatic shut-off feature comes in many different versions, but the most popular (and the safest) is the overheat protection function. This means the heater will shut off if it starts to get too hot or is left on for too long. Size: How big is the heater? You can often determine how much space it will heat by how big the heater is. If you’re looking for a heater that will fill a specific space in your home, this is important information. Power: The power can also be an indication of how much heat it can put out. It’s also an indication of how much power it takes to run. If your power bill gets out of hand, keep an eye here. Adjustable Thermostat: An adjustable thermostat will allow you to fine-tune how the heater works, often down to the temperature of the air it puts out, or how warm it will keep the room. It’s a great feature in a ceramic heater. Weight: How much does the heater weigh? Sometimes, you’ll want to take it to the room you’ll be occupying, and this will tell you if that’s a plausible expectation with the particular heater due to how heavy it is. Warranty: A warranty is an assurance from the company that their product is going to work. If it breaks or fails during this period, you’ll be able to return it for a refund or replacement. A great company supports their products! With that information under your belt, it’s time to get cozy and take a look at our choices for the top ten ceramic heaters. Our top pick and budget pick are highlights, so check them out before moving on to the rest out our list. All of these heaters are hot sellers, so make sure that you choose the one you prefer quickly! Make sure that everyone in your home stays warm and comfortable even on the coldest winter days. A space heater is a great option for larger rooms. 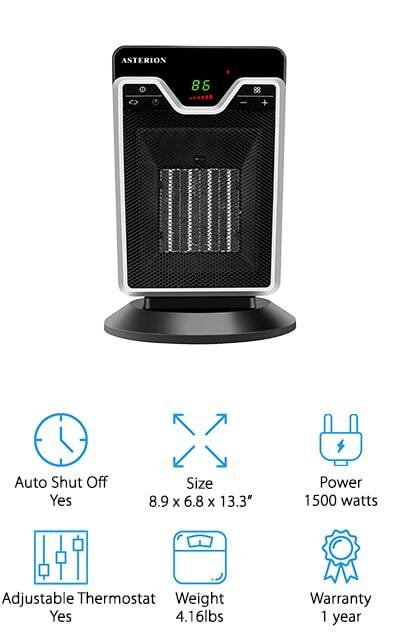 Air Choice makes this great ceramic heater with a high-powered fan that works to drive the chill out of your room quickly and efficiently. This is one of the best ceramic tower heaters on the market right now because it heats up surprisingly quickly. It even oscillates so the heat is shared around the room rather than projecting heat to a single spot all day long. You can use this heater under the desk to keep your feet warm in the office or to keep your hands warm while you’re working. It comes with an automatically adjusting thermostat that cycles on and off to maintain the selected temperature. Using it overnight has never been easier, and you won’t wake up boiling in your room! Plus, it has overheat and tip-over protection that will automatically shut it off when it gets too warm, or when it hits the floor. When you need a cheap ceramic heater, consider this one from Brightown. It features two different heat settings, the highest which runs at about 1500 watts, and a lower heat level at 750 watts. It automatically shuts itself off if it overheats, which is great when you need to run it for longer periods of time. It also includes a normal cool blowing fan for keeping spaces cooler if it gets too warm, or during the long summer months. You shouldn’t use it in wetter environments like the bathroom, but other than that you can use it in medium-sized rooms to keep you cozy even on the coldest of days. It runs quietly and provides smooth, radiating heat and will sooth away your chills. When it comes to your heat, you can’t afford to play games, so get one of the best affordable ceramic heaters on the market. We know that you’re going to love it! Lasko, a well-trusted name in both fans and heaters, is the maker of this amazing ceramic tower heater. It’s the best ceramic heater, large rooms included - it will chase the chill out of every corner of your home. It includes overheating protection to prevent it from starting a fire, as well as a cool-touch housing so your pets and children won’t get burned if they get curious. The maximum output is at 1500 watts, with a low setting, a high setting, and a controlled thermostat setting. This last option includes an auto-off timer that you can set if you only want the heater to work for a certain amount of time before turning itself off. It comes fully assembled so you don’t have to do anything, just plug it in and start getting warm. It’s portable and you can take it with you into the room you’re in to get the most comfortable temperature. 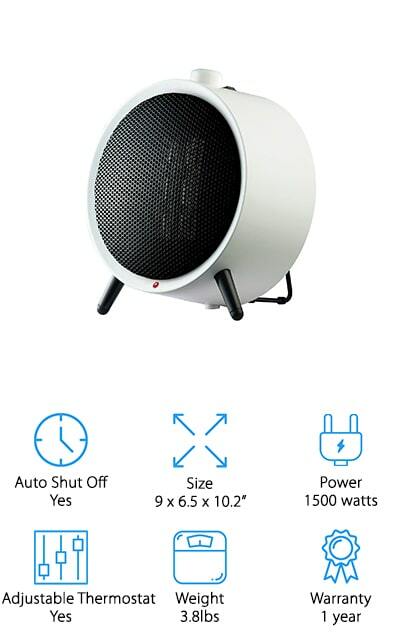 Andily makes this small ceramic heater that runs on 1500 watts of power – enough to warm any smaller-sized space at your home or office. It’s great to use under your desk to keep your feet and legs warm. 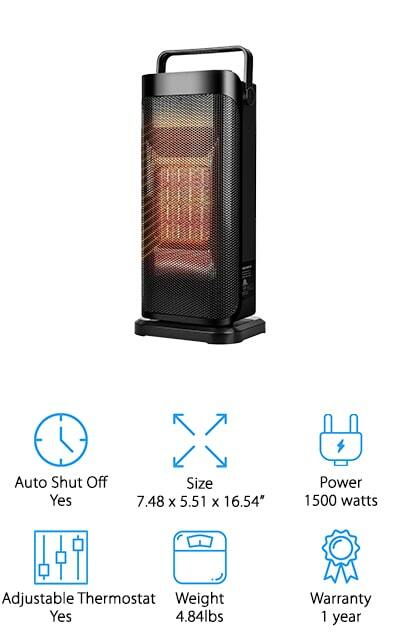 There are three modes for this heater, a higher heat setting that uses 1500 watts to run, as well as a low heat setting that uses about 750 watts to keep the air around you moderately comfortable. The fan-only setting is useful for cooling down spaces that are too hot, or for use in the summertime. This thermostat system allows you to maintain the perfect temperature for your space. There is an overheat protection system that shuts it down if it gets too hot, as well as a tip-over switch so it won’t run if it tips forwards or backward. You can tell if it’s plugged in by the indicator light, which is a useful feature! Trustech makes one of the best ceramic room heaters that we found during our research. 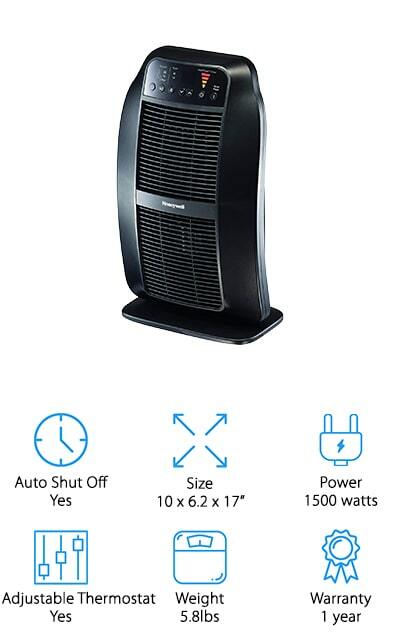 This fan is so amazing because it has a 120-degree oscillation function that allows it to spread the heat around the room without worrying about the confusing stationary angles that work the best. You can use it personally, or use it to take the chill off the room and give your furnace a rest. 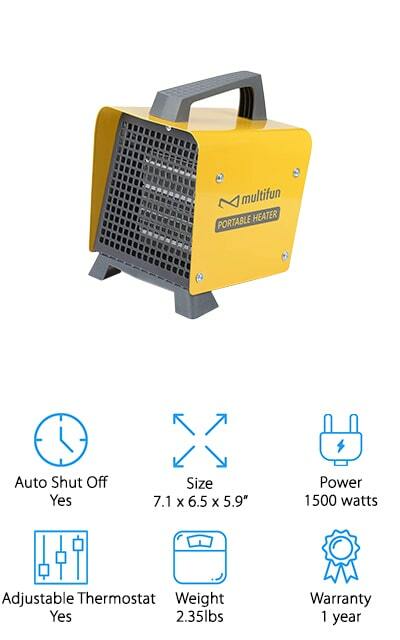 It runs at 1500 watts, perfect for putting out a ton of heat very quickly. The thermostat can be adjusted, so that the heater will automatically cycle on and off to maintain a constant perfect temperature, depending on how you set it. You won’t wake up to a super warm room, or one that’s too cold to get out of bed. It features tip-over protection to keep fire risk down, as well as overheat protection for your peace of mind. It doesn’t get much better than this heater! 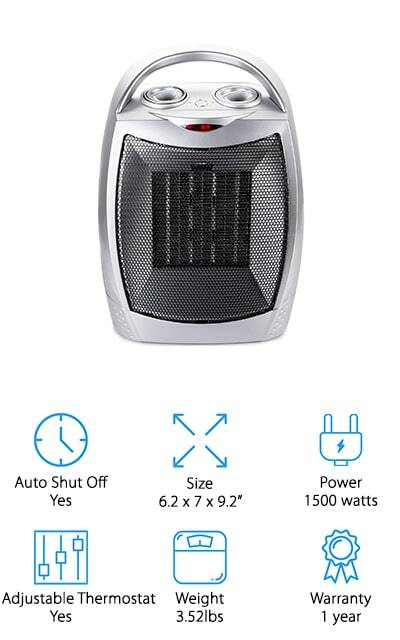 This small heater by Sendowtek is a great space heater that can warm you up quickly. It uses only a little power to maintain that heat setting after it reaches your optimal temperature. There are no open flames, and you can save a ton on your heating bill! 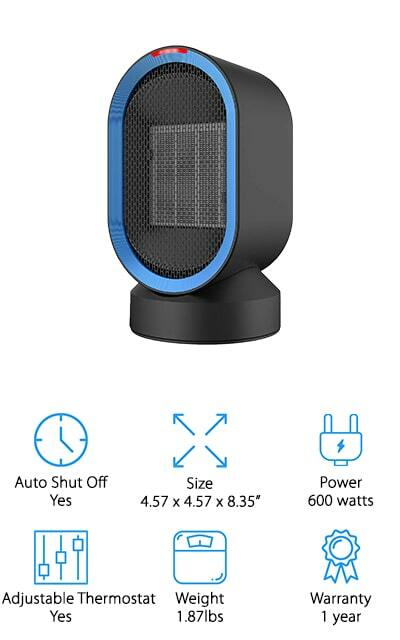 It has two different functions that allow it to be both a heater and an electric fan, so you can keep it out and use it year-round if you’d like. It has an automatic shut-off function if it overheats or tips over, saving you from electrical fires and other risks associated with electric heaters. There’s a handle on the back to make it easier to carry, and it even has an oscillating function to keep the heat going to all parts of the room that you’re in. There is an indicator light that tells you if the heater is still plugged in – a great energy-saving feature! We love this heater. Multifun makes this great space heater, and you might even begin to prefer it over the best ceramic wall heaters! It’s made with flame-resistant materials to keep risks down, as well as a metal shell rather than a plastic one. That makes it a durable and safe heater. There is a red LED light to tell you when the heater is on and working properly, so you can tell at a glance. It heats up in a few seconds, and then maintains that heat for longer periods of time. You can adjust the thermostat to any temperature between 41 and 95 degrees to keep your room as comfortable as you’d like it. The angled legs allow hot air to be pointed upwards, heating the room quickly and efficiently. Place it under your desk to get instantly warmer feet to boost your work productivity! Everything about this heater is geared towards safety and practicality, all while keeping you comfortable! This ceramic space heater by ASTERION has an amazing five different options, and it doesn’t just work as a heater! This one device can keep you comfortable all year round with the low setting (running at 900 watts), high heat setting (1500 watts), an eco-setting that runs for energy efficiency, and a fan to distribute air. The last mode is a ‘freeze’ mode that runs at 45 degrees. 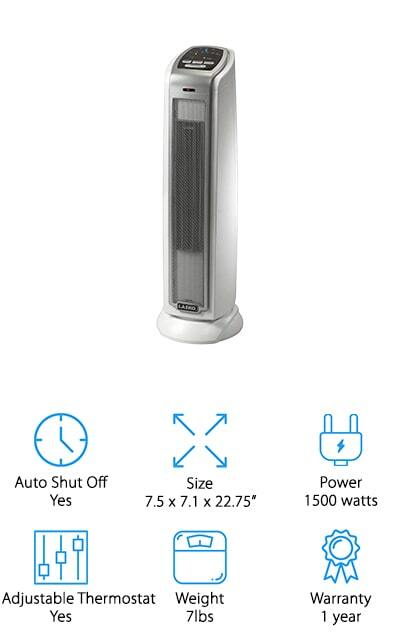 Paired with the fan setting, this could be a comfort device that you use all year long. Eco mode turns the heater on and off to maintain a setting and you can set the temperature via the LED screen. Plus, it oscillates and you can set it on a timer. If you want to change the setting, you can easily use the remote control without getting up from your cozy nest! Everything about this heater is smart and convenient so that getting comfortable isn’t a hassle anymore! Honeywell is back on our list again with the HeatGenius. 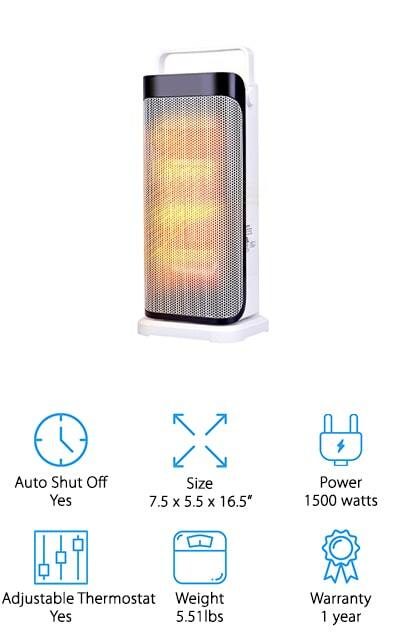 This amazing heater runs at 1500 watts on its highest setting – the highest of six different settings. These include quiet mode, thermostat control (which you can program from the machine itself), personal heat, floor only, or a whole room. The sixth option is their unique HeatPhase Timer, which heats up quickly and then gradually transitions back to a cooler temperature over a two-hour period of keying down the temperature a little at a time. That’s really unique! We love the tip-over and overheat protection, as well as the cool housing and ability to warm only the floor if that’s what you need. This is an intelligent heater that allows you to customize the way that you receive your comfort – and that’s something that we can all appreciate! 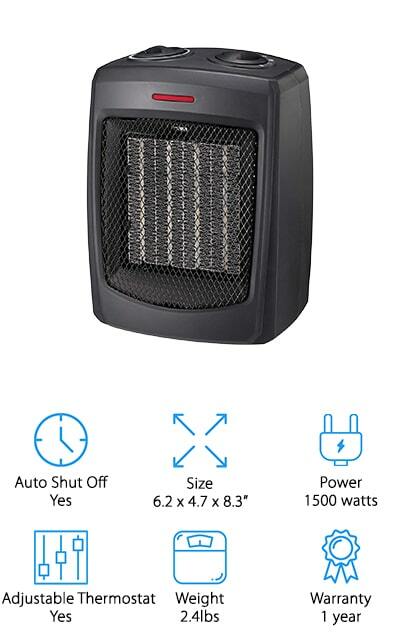 You can use it for larger areas or smaller spaces, all with the same portable heater! You’ll stay cozy all winter with this heater! The Honeywell UberHeat Heater is great for smaller spaces, making it the best ceramic heater for RV use that we could find. It’s a relatively small device that puts out just enough heat to keep your small spaces warm and cozy. There are two heat settings, a low setting that consumes less power and a high setting that runs at 1500 watts for distributing even heat. It’s energy efficient, so you don’t have to worry about your RV overusing energy. You can place it on the floor or on a tabletop for best results, wherever you need it. It’s lightweight and extremely portable, with tip-over protection and cool touch housing to save your fingers when you need to move it. It also turns itself off before it overheats, so you can get warm with your peace of mind intact. This small personal heater will work to save you cold fingers and toes while also heating a small, energy-efficient space.